I've actually been wearing an Audio Power Labs t-shirt for a few months now without knowing who they were or what they do. Well, now I know. 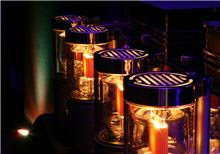 Audio Power labs makes one of the most beautiful, hefty and expensive tube amplifiers ever made. The price of a pair of these giant monoblock beauties is $150,000 or $175,000 (I heard both prices during AXPONA). After an extended listening session with the TNTs, I have to admit that they recreated the essence of live music with uncanny precision. I know a handful of $10,000 amplifiers that play in the same ballpark as the TNTs, but they're shagging balls instead of playing in the starting lineup. With a piece of gear of this caliber, it's hard to determine if you're getting your money's worth unless you spend a lot of time listening to them, and ensure that you've hooked up the best possible system around them. For what it's worth, I think they're pretty special. I was on High-End MOC 2013. I have heard 833TNT with Goya G2 speakers. It was the best sound of the show. Nothing was close. Period. I was surprised because I never heard about Audio Power Labs and there have been a lot of great well established companies.